The $22.225 billion budget proposal that the state House of Representatives released for the upcoming 2017 fiscal year reflects the limited aspirations for North Carolina that the House and Senate leadership have agreed on. Legislative leadership used a flawed formula to set a low budget target — even lower than the Governor’s $22.33 billion proposal — that has no basis in economic realities or community needs and leaves $127.4 million on the table unspent. Overall, the House proposal represents a 2.26 percent — or $490.3 million — increase over the current 2016 fiscal year budget. This proposal reflects leadership’s loyalty to severe budget constraint and lopsided tax cuts, which primarily benefit profitable corporations and the wealthy. Lawmakers are allowing these tax cuts to phase in — which will cost more than $2 billion once fully implemented — regardless of the need to replace the worst cuts from the economic downturn and address long waiting lists. In fact, the proposal implements further costly tax changes that limit the ability to meet pressing needs (see details below). The low target helps explain why House leadership is pressed to leave $127.4 million on the table unspent, even after putting money into the savings reserves accounts and despite unmet needs in communities across the state. That is funding that could address the NC pre-k waiting list and hire the additional school nurses needed to improve student health and meet national standards. In fact, the House budget would keep state support for services below pre-recession levels, when adjusted for inflation. That would be fine if public needs had shrunk. But they have grown. The budget also caps off the only period as far back as 1971 in which state spending would decline as a share of the economy for eight years in a row while the economy itself grows. As such, many unmet needs will persist in programs that support vulnerable communities, despite a slight increase in investments and a modest compensation package for teachers and state employees. To start out, the House relies on revenue collections coming in above what officials anticipated, money they anticipate agencies will return to the state (known as reversions), and other one-time dollars to help finance the budget. Revenues are expected to come in above conservative projections by $330.2 million for the 2016 fiscal year. Also, they have access to nearly $498.8 million in unspent money that is expected to be left “on the table” at the end of the current fiscal year. This includes agency reversions. They use about 54 percent of the over-collections and unspent money to boost the state’s main savings account (“Rainy Day Fund”) and the savings account dedicated to repairs and renovations of state properties. They use part of the remaining money to transfer $150 million into the Medicaid reserve fund. They carry over the remaining $215 million into the upcoming budget cycle. On top of the money that the House expects to carry over at the end of this fiscal year, they expect to receive $22.2 billion in base revenue — an amount that is severely constrained by previously-approved tax cuts. Most of the revenues will come from taxes, primarily from the state income tax, sales tax, and corporate income tax. The remaining revenue comes from other non-tax sources. The $22.2 billion projection is a modest 1-percent growth rate over the current fiscal year. This modest growth is “below long-term average growth and typical growth during economic expansions,” as state budget officials pointed out earlier this month. That’s mostly due to tax cuts. The revenue total is diminished by the sizeable cuts to the personal and corporate income taxes that lawmakers approved over the last few years. On net, the already-approved tax changes (that also include sales tax expansions) are expected to result in a $1.3 billion loss in the upcoming fiscal year. 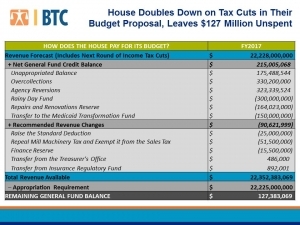 The House doubles down on tax cuts in their budget proposal. Their proposal reduces General Fund availability by $25 million due to raising the standard deduction to a maximum $16,000 from $15,500, based on filing status. It also raises the maximum by $500 each year over the subsequent three fiscal years. This approach is more costly and not as well targeted as restore the state EITC, which does a better job of helping working families and addressing inequities in our tax code. They reduce General Fund availability by another $51.5 million for a tax break exempting mill machinery from state taxes. They also set aside $15.5 million for an unspecified “finance reserve,” which could possibly be used to finance further tax cuts. They boost General Fund availability by nearly $1.4 million due to transfers from the Insurance Regulatory Fund and the Treasurer’s Office. 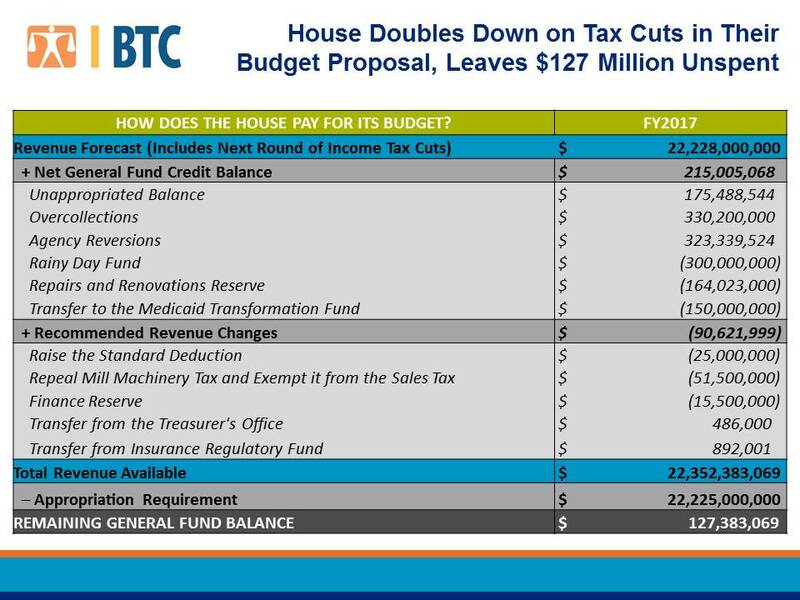 After appropriating $22.225 billion, in the end the House leaves nearly $127.4 million on the table in the 2017 fiscal year that can be carried over into the next budget cycle. See the chart below for a summary. The House budget retains the $35 million annual subsidy for the State Ports, flying in the face of the long-standing ports tradition of being self-sufficient and swallowing whole a foolish plan to make improvements to the Port of Wilmington to accommodate a new generation of very large Asian container ships that cannot possibly navigate the Cape Fear River to the port.